Marian McCormick and Chris Harvey joined colleagues from across the UK who have been awarded funding from HEFCE via the Catalyst Fund to develop innovation in higher education learning and teaching. The workshop represented an exciting opportunity to learn about the various projects under way and the approaches that project teams were taking to assess the impact of their pedagogic innovations. A wide range of ideas was showcased, including everything from app-based learning support technologies to face-to-face tutorial interventions, all designed to support student success. A particular theme we took home form the workshop was that the ‘student voice’ should inform innovations and how we develop and diversify learning and teaching in higher education. 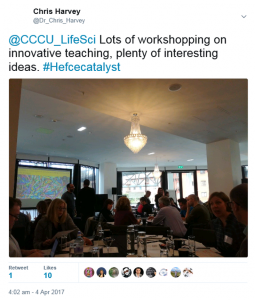 It was a valuable and inspirational experience and we thank HEFCE and our fellow Catalyst project teams for creating such a productive and collaborative atmosphere.